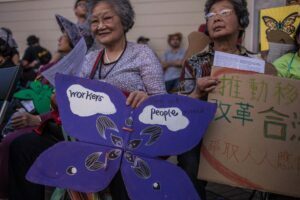 Chinese people in Oakland have endured years of racism, housing and employment discrimination and displacement. APEN has organized Oakland Chinese immigrant families since 2002 to build a healthy neighborhood where low-income immigrants can live, work and thrive. Champion renewable energy and jobs for Oakland residents! Click here for an update on our Build Chinatown campaign.